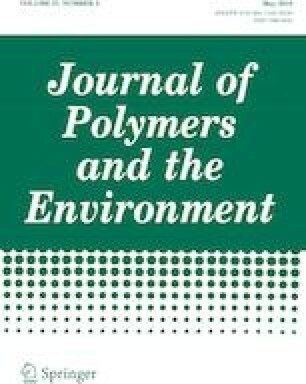 In this work, the effect of ethylene vinyl acetate (EVA) content on the rheology, mechanical properties, and morphology of poly (lactic acid) (PLA)/EVA blends was investigated. Differential Scanning Calorimetry (DSC) showed that the addition of EVA to PLA decreased the degree of crystallinity of PLA. Dynamic Mechanical Thermal Analysis (DMTA) results showed that the presence of EVA copolymer increased the cold crystallization temperature (Tcc) of PLA. The addition of 10% of EVA to PLA substantially increased the impact strength. Morphology analysis by Scanning Electron Microscopy (SEM) indicated the immiscibility between PLA and EVA phases and an in increase the EVA average dispersed phase domains size with the increase in EVA content. Rheological measurements under oscillatory shear flow showed that storage modulus (G′) increased with the increase in the EVA content at low frequencies and is related to the increase in the EVA dispersed phase domains size, as also observed by relaxation spectrum analysis. Cole–Cole plots of imaginary viscosity (η″) versus real viscosity (η′) and Han plots of storage modulus (G′) versus loss modulus (G″) indicated that PLA and EVA phases are immiscible, as also observed by SEM. The authors thank CAPES and CNPq for financial support.